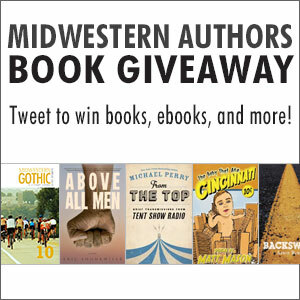 We’re thrilled to announce our second annual Midwestern Authors Book Giveaway, where you can win books and eBooks from some of the best talent the Midwest has to offer. And the best part is, all you need is a Twitter account to enter. To enter: Retweet any of the contest tweets next week. That’s it! You can get a bonus five entries when you sign up for our email newsletter! Click here to subscribe – your entries will be automatically entered for the Grand Prize. Contest Dates: Monday, August 11, through Friday, August 22. Grand Prize: 1 Yearly Print Subscription to Midwestern Gothic (4 issues), 1 Midwestern Gothic: Summer 2014 – Issue 14 paperback, 1 signed copy of This Jealous Earth, and 1 signed copy of Above All Men. 2nd Prize: All 14 issues in the Midwestern Gothic catalog in eBook format.